Beginning in 2003 when XLAB started, in 2017 the XLAB International Science Camp (ISC) took place for the 15th and final time. Each year also the course Physics of Flying was offered. For the ISC in 2017, a modified concept was developed: a one week project work Research in Aerodynamics. More details to both the project work and the course are given below. At the end of 2017, the society "Göttinger Experimentallabor für junge Leute e.V." (XLAB Experimental Laboratory for Young People) ceased to exist, and XLAB turned into an educational institution of the University of Goettingen. 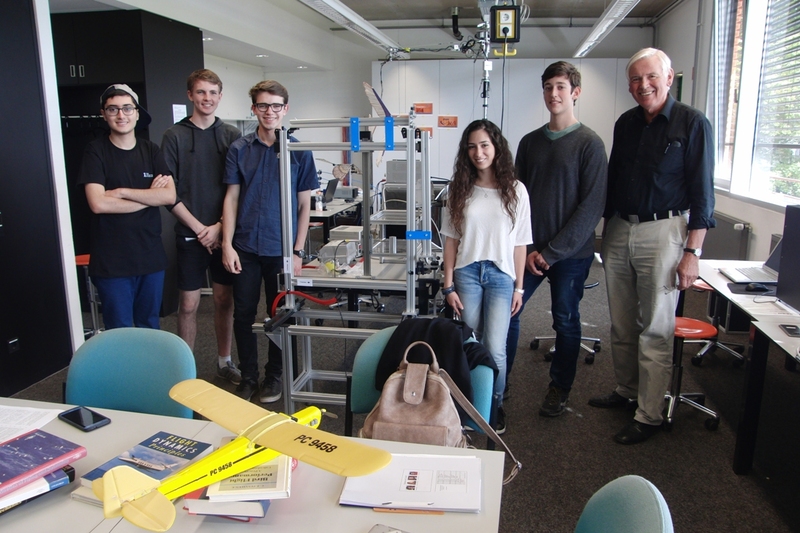 The course is held by Wolfgang Send, theoretical physicist in the field of aerodynamics and structural mechanics at the German Aerospace Centre (DLR) until October 2009. Contributing to modern concepts for teaching aerodynamics in several publications, he has developed the course since 2003. He is committed to animal-flight research more than ever, and between 2009 and 2011 he developed with a small team an artificial bird based on his theoretical concept of active torsion with unprecedented agility (link leads to its flight performance, 1:48 min). A movie introduces to the SmartBird project ("Birdflight deciphered", 18 min; produced by the FESTO company's Bionic Learning Network which financed the project). 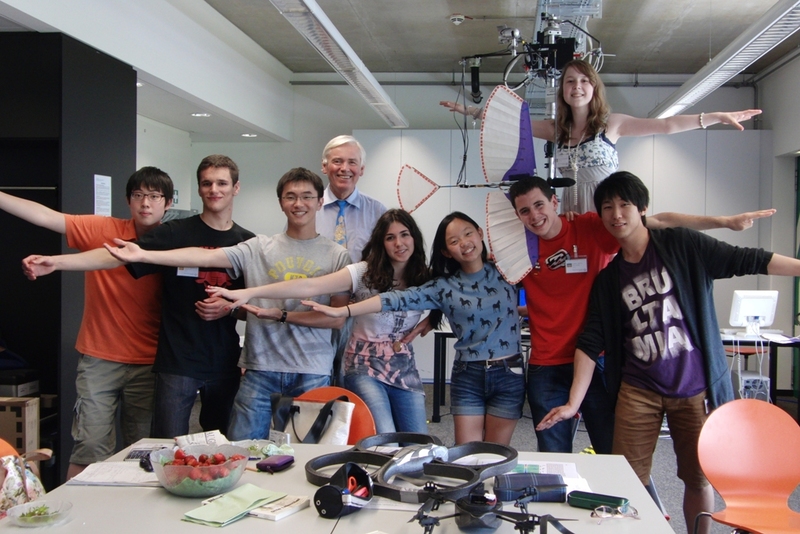 Recently, his commitment to the aerodynamics of flapping wings led to the development of the energy harvester DualWingGenerator, which was presented 2014 on the occasion of the annual international industry fair "Hannovermesse", again within the framework of the FESTO company's Bionic Learning Network. Tools and skills. 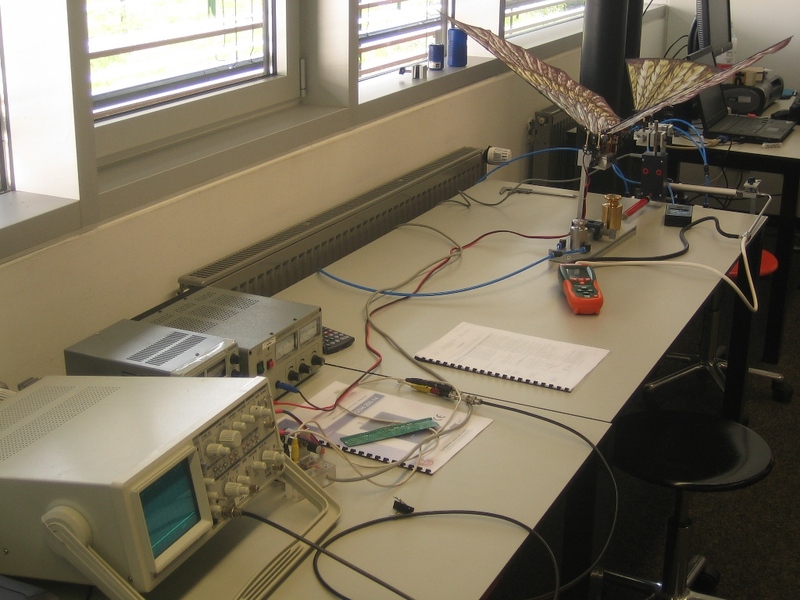 The one week project work mainly dealt with experimental techniques which are typical of aerodynamic research: measuring force and pressure with sensors, observing vibrations with accelerometers, acquiring measured data with modern data acquisition systems, also using wireless communication. The control and operation of stepper-motors with micro-processors (for a defined motion) was touched to the extent which was required for the projects. Among others, two small wind tunnels, a rotor test stand and an air bearing for frictionless motion belonged to the available devices. A simple control tool for setting the desired wind speed of one of wind tunnels was applied (using National Instruments' software LabView). A local area network (LAN) was established which connected all computers and micro-processors to each other. Knowledge. 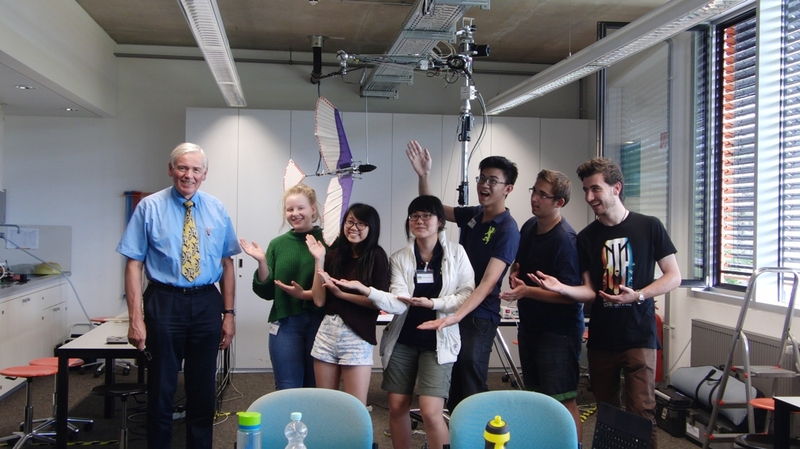 The project week was enriched by short lectures on the Physics of Flying, Aerodynamics: A Part of Fluid Dynamics, Statistics of Data Series, a few words about Modern Transport Aircraft and the Design of Large Wind Turbines. Depending on the number of participants and how well they were grounded in physics and maths, the precise definition of the projects was settled at the beginning of the project week. 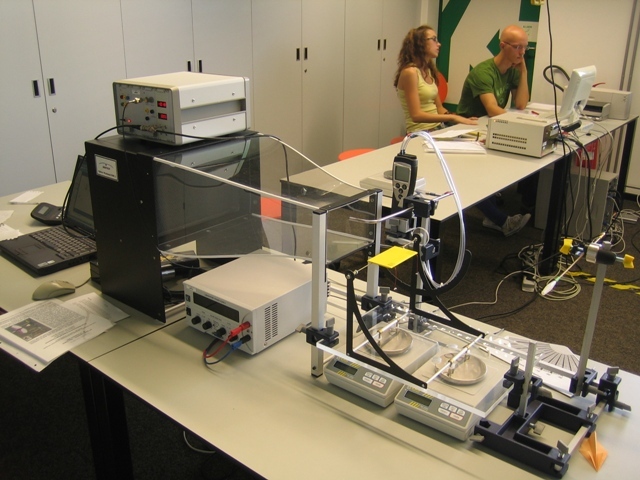 The scope for experiments was not entirely different from that in the course except that there was much more time for in-depth work and practical training (e.g. no work on presentations). The lecturer's comment after the project week. It turned out to be a problem diving into aerodynamics and measuring techniques without hardly any previous knowledge. That was different from the course where knowledge was built up step by step and day by day. XLAB's intention was to offer a one week lab visit after the ISC for interested students. Thus, the lecturer moved a considerable part of his laboratory equipment to the XLAB facility, which took half a week of preparation and subsequent maintenance. After that many years, the time has come to take it as the highly enjoying final of this series of courses. Here, a quick overview of the past courses is presented. the notable flutter phenomenon of an airplane wing, in which - above a certain speed limit - power is extracted extremely fast from the surrounding air-stream, with the potential of destroying the airplane. 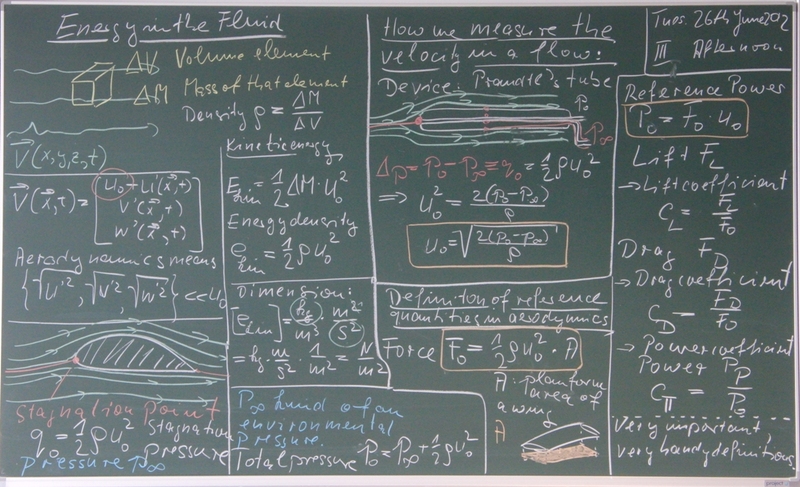 The course introduces to basic skills performing measurements in Aerodynamics. 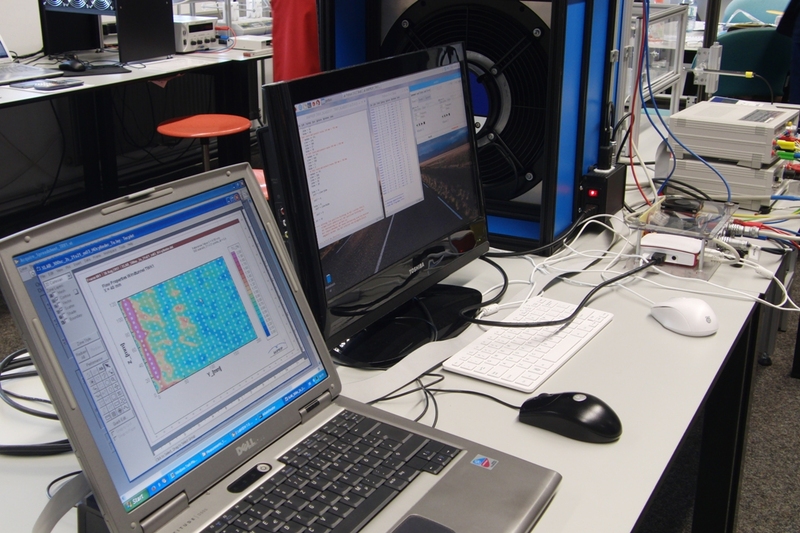 Among others, it is composed of exercises with the test stand ANIPROP RL3 and its components (the link leads to a description of its scientific basis). During the last few years, a glossary was set out collecting a host of questions which were touched on. The XLAB_ISC_Glossary (0.8 MB) is kind of knowledge base for the next courses. Besides learning a few things about birds and planes, you will be challenged every day. to give a presentation with a laptop or using flip charts: clear, concise and considerate to the audience. Last, but not least: To have fun with each other! Wolfgang Send is very much looking forward to guide you to the physics behind birds and planes. The course in 2015 gave me, the lecturer, unexpected pleasure. 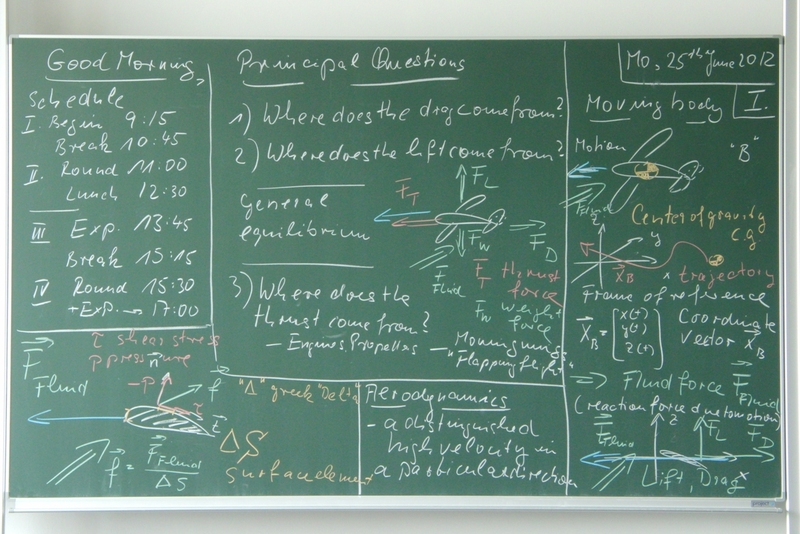 Being different from all preceding courses, the students asked me to put even more emphasis on the theoretical inserts and to hold an additional lecture on where the thrust of birds comes from. 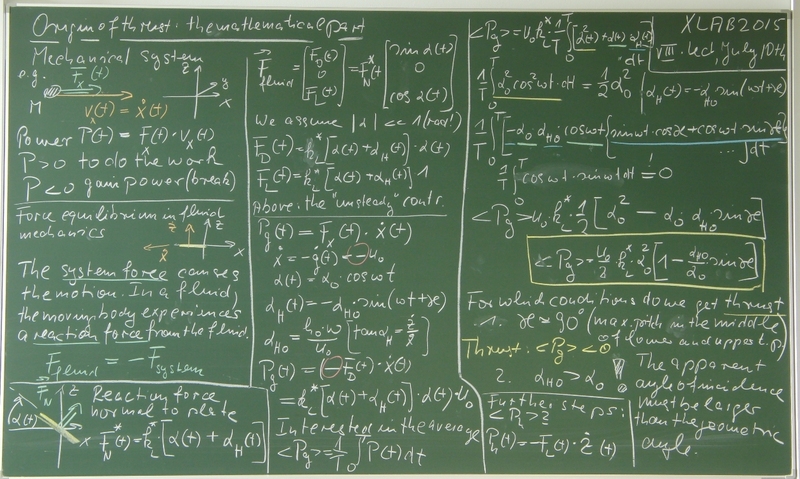 The result on the blackboard ist added at the end. That certainly will remain an exception.